You might already use bins in your hospital supply storage, and for good reason. They’re a great way to organize supplies for easy retrieval, are easy to clean, and last a long time. 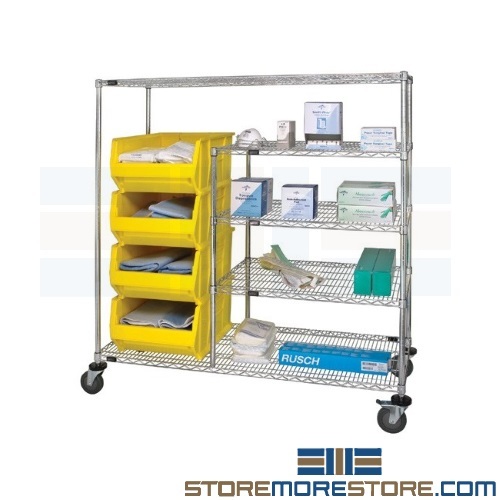 Now you can mobilize your system with medical bin carts on wire shelves to transport supplies anywhere and anytime. 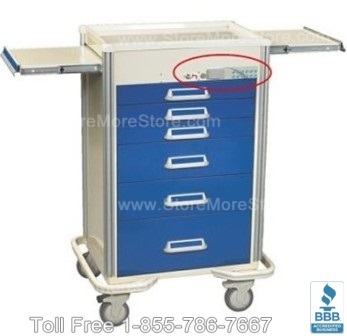 What also makes the medical bin carts a great storage system is its modular design. Unlike traditional carts, you can customize these bin systems to your exact workflow needs. And if those needs change, it’s easy to reconfigure the bins as needed. The bins themselves are designed to fit perfectly onto the wire carts with no space wasted while allowing users to easily see and retrieve each bin’s contents. But what else makes these bins ideal for hospital use is their injection-molded polypropylene construction. This material can withstand extreme cold and autoclavable temperatures up to 250°F so you don’t even need to remove supplies from the bins. The bins are also corrosion-free, easy to keep clean, and manufactured with FDA approved materials. Medical bin carts are available to buy online and ship within 10-15 business days with free dock-to-dock shipping included. If you need any assistance or just want some help picking the right solution for you, please call us at 1-855-786-7667. Since the 1980’s, the Broselow Tape has been used to help emergency room personnel treat children. The color-coded tape helps relate a child’s height and weight to the dosages and equipment that should be used. 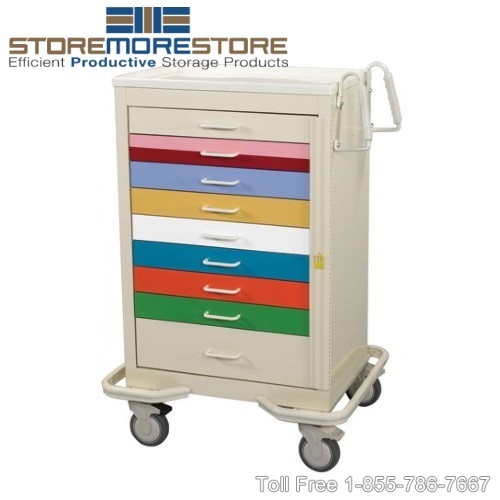 With that in mind, StoreMoreStore now offers a line of pediatric emergency carts with drawers that match the Broselow Tape. Why the Drawers are Based on Broselow Tape? The pediatric emergency carts store everything you need to respond to life or death situations including reference books, medications, airway equipment, and IV solutions. This specially design cart will improve response time and effectiveness by keeping the right size equipment easily accessible and already sorted for the size infant or child that you’re attempting to revive. Colors – 17 powder coat colors available in two-tone or solid finish. Double Wall Construction – All aluminum and most of the steel carts have double-wall construction for long-lasting use, durability, and strength. Plastic Top – Extra thick top has a 1/2″ inch ridge to keep things from falling off when moving your cart. Tops are latex-free where indicated. Twin Poly Push Handles – Handles make carts easier to push and steer. Available only on specified carts. 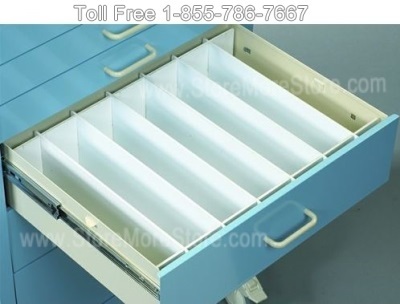 Full Extension Ball Bearing Drawer Slides – Full extension drawers allow you to see all the items in the drawer. Casters – Ranging from 2″ economy to 5″ premium quality casters as specified per cart model. Outrigger Stabilizing Base Frame – anti-tip stabilization and bumpers for cart protection on specified carts. You can find all of our medical carts online here, including the pediatric emergency carts. And if you need any help or have any questions, please give us a call at 1-855-786-7667. At StoreMoreStore we have a variety of solutions just for the healthcare market. With all kinds of medical carts, a pharmacy drug cabinet, and shoe cover dispensers, you’re sure to find exactly what you need to improve storage and efficiency at your healthcare facility. Our complete line of medical carts includes emergency crash carts, anesthesia carts, and supply storage carts designed to be suited for your facility’s particular needs. Our medical carts are made completely in the U.S.A, and are solid steel or aluminum construction. Each of our carts has various locking and drawer configurations. 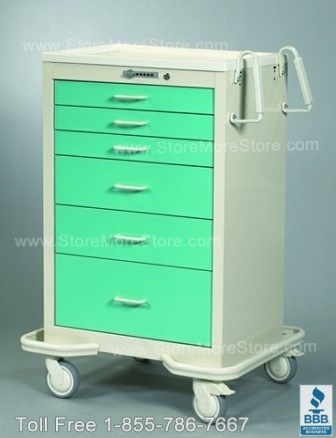 Most of our medical carts come in 14 standard colors. 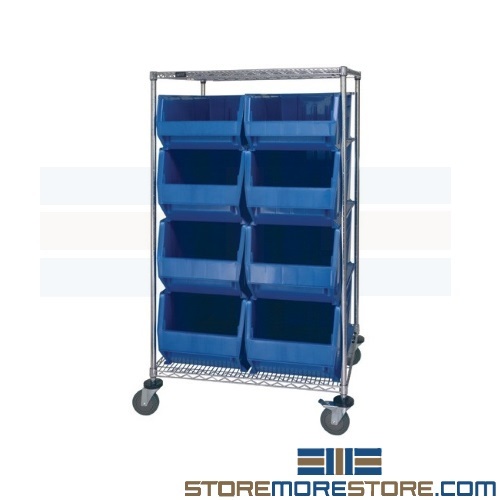 In addition to emergency crash carts, anesthesia carts, and supply storage carts, we also have wire shelving carts. 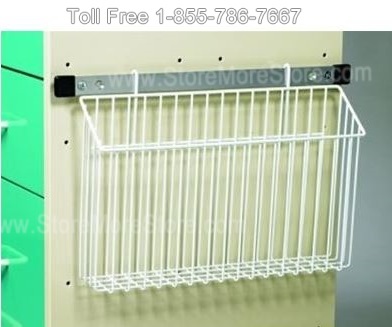 These work great for storing medical products in supply rooms. You can also use them to set up a Kanban storage system (find out more about Kanban in a previous blog here). 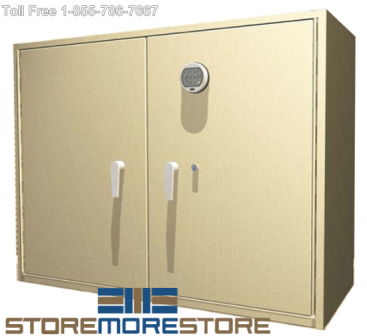 The pharmacy drug cabinet is designed to offer secure narcotics storage so that your medications are safe from all types of theft, including in-house personnel and outside criminals, while offering you convenient access to drugs. With the optional cable and software, a designated manager is able to limit, designate, and track employees using the cabinet. The software provides a manager mode with eight additional users allowed with their own specific codes for the electronic keypad lock. In addition, the software will maintain an audit trail (both the date and time) of the last 512 times the Pharmacy Narcotics Cabinet was accessed. There are two different models, depending on your needs. The Fusion shoe cover dispenser is designed to be light-weight and portable so you can take it with you anywhere. 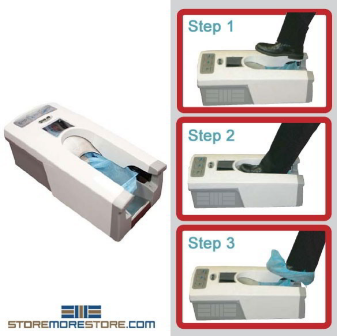 The Stay shoe cover dispenser is designed to “stay” right where you put it. Keeping the dispenser at the entrance to a room is easy because of its low profile. And the dispenser is equipped with a handle so you can steady yourself while using it. We also have many different types of booties that will fit in the shoe cover dispenser. Visit our healthcare solutions home page to shop for medical carts, wire shelving carts, the pharmacy drug cabinet, and shoe cover dispensers. If you have any questions or need any help, please give us a call at 1-855-786-7667. When you work in a medical facility, you need to have supplies and medications with you and easily accessible. That is why many professionals use carts. 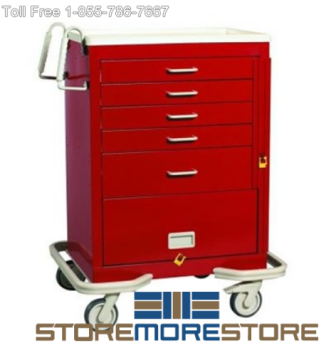 At StoreMoreStore we provide numerous different Hospital Carts including emergency room crash carts, pediatric carts, anesthesia carts, prescription carts, and more. In addition, we also have accessories that will maximize the use of all our Hospital Carts. We understand that there is no one-size-fits-all Hospital Cart. This is why we provide a variety of carts. 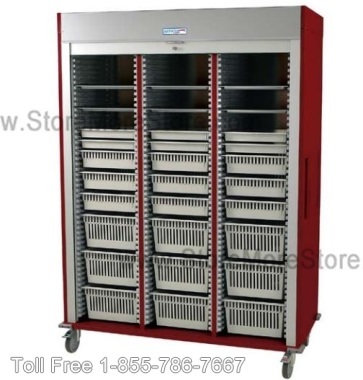 For example, we have a pre-configured triple-column cart with a roll-up security door that works great for maximizing space and keeping stored items secure. This is ideal for use in surgical procedures related to orthopedics. 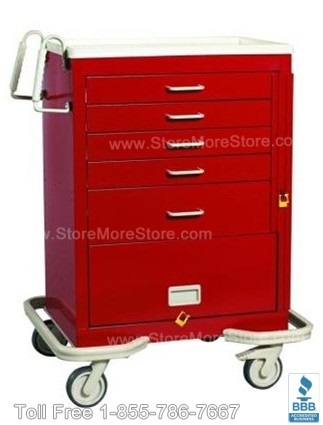 You can find all of our available Hospital Carts and accessories online at StoreMoreStore. And if you can’t find exactly what you are looking for or need any assistance ordering, please give us a call at 1-855-786-7667 to speak with a representative. Our Mobile Anesthesia Carts offer many features and benefits for medical supply storage. 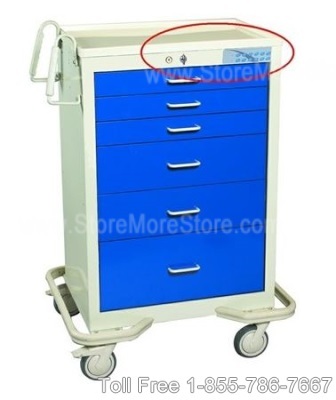 The Mobile Anesthesia Carts are made out of double wall steel which allows for maximum durability and strength. The thick plastic top is extremely tough and has a ½” ridge that will keep medical supplies and other items from falling when the cart is in motion. The cart’s handles are very easy to steer and push so anyone can use the cart. The Mobile Anesthesia Carts come with premium 5” swivel casters – 2 locking and 1 directional locking – to help facilitate easy steering. The Mobile Anesthesia Carts’ long-lasting powder coat paint is available in 14 different colors so you can fit it into your existing color coded system. The full extension ball bearing drawer slides allow you to see all the items in the drawer, including the items stored in the back. The outrigger stabilizing base frame has anti-tip stabilization and bumpers to protect the Mobile Anesthesia Cart. All of our Mobile Anesthesia Carts are made in the U.S.A.
You can find several different styles of Mobile Anesthesia Carts online now at StoreMoreStore. And if you can’t find what you are looking for or have any questions, please feel free to call us at 1-855-786-7667. Also, if you are looking for other medical supply storage options check out our Hospital Carts and Plastic Bins & Accessories!